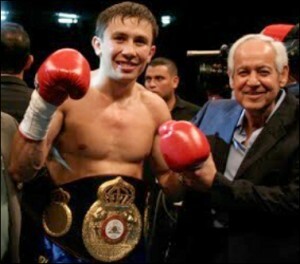 After the World Boxing Association Middleweight World Champion, Gennady Golovkin, made his fourth successful defense this year, I would like to talk about this great boxer’s stats. Although many people think Golovkin does not have a tough defense, his numbers this year speak different on the work he has done in his fights. Let’s talk start with his most recent fight with Curtis Stevens, who challenged him and even said he would tear him apart in the ring at the Madison Square Garden in Nueva York. Well, in that fight, Golovkin launched 794 hits and connected 293, which means 37%, from my point of view, a whole machine. Stevens managed a respectable 32%, the thing is that he 303 and landed 97 according to Compubox. The jabs, the basic punch the Kazakh champion uses at will and shows very striking numbers. Golovkin launched 413 and landed 108, while his opponent launched 113 and landed only 23. Eso traduce 26 contra 20%. In terms of power shots Golovkin got 49% and his challenger 10 points lower. The interesting thing about Golovkin, a boxer who is always on top of his rival as a hunter after the pray, and always work in key areas to break his opponents. Combines blows to the head and body, and in each round on average throws nearly 100 punches getting slightly less than half of them, before Stevens, at least 37 per round. Only in jabs, he scored twice the average in its class. Now should Stevens was not as easy as everyone thought. He stood there and bore and even tried to disrespect the champion but when the champion cornered him and got him straight. He showed him respect. However, he managed a 39% of effectiveness in his punches thrown after the fall that took in the second round. The rest of the fight he spent most of the time fending off Golovkin. Now let’s move on to general lines and the fights Golovkin made Nobuhiro Ishida, Matthew Macklin, Gabriel Rosado and Stevens. In average Kazakh of hits which releases Golovkin by round is 76.5 43.5 rivals and 56.7% is normal between medium. Ahora pasemos a líneas generales y las peleas que Golovkin hizo ante Nobuhiro Ishida, Matthew Macklin, Gabriel Rosado y el propio Stevens. Golovkin’s average punches thrown by round are 76.5, and his opponents’ 43.5 and the normal averaged is 56.7%. As for the punches landed by round, Golovkin had an average of 31.6%, his opponents 11%. The Middleweight average landed punches is 17,9%, and the division average is 31% and he managed 41%. In sum, Golovkin exceeded his last four opponents 3 punches to 1. His team already announced other four dates for next year’s defenses and the champion asked for the Argentine Sergio “maravilla” Martínez, the question is if the latter will accept to fight this machine who besides skill and talent, has charisma. There is still much to see of Golovkin, but for sure it will be more of the same, with the difference that a KO will be more or less spectacular than the other.